What would life be like for you if you could learn ways of connecting into the realms of mystery & magick, how you could fully anchor your innate capacity to be in tune & work with the earth elements, to play & explore the possibilities of your spiritual & personal expansion? 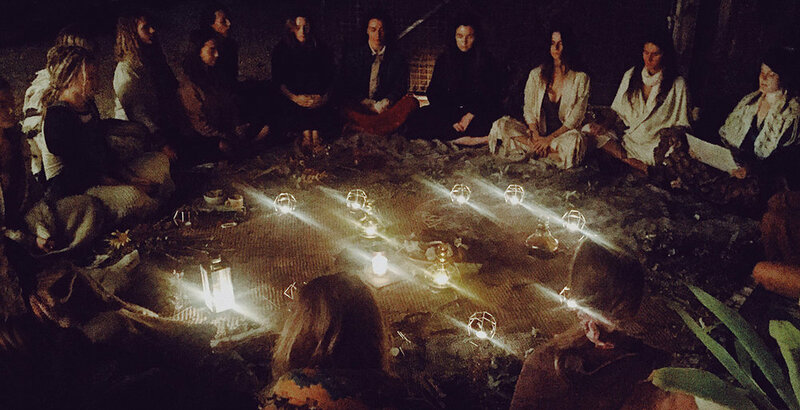 I invite you to embark on a journey where you can cultivate a relationship with the sacred, powerful & creative witch that lives within you & create friendships with a tribe of similar spirited wild women, who like you, are deeply desiring to expand their connection to themselves, the earth & the cosmos. Magick is one of the oldest pursuits of humanity & I personally define magick as the unique energy threads that run through everything, connecting it all together. The navigation of magick was practiced in caves by tribal shamans, in early religions & in secret by those who were persecuted by authorities from more organized religions. It’s unfortunate that for so long this knowledge has been hidden & shamed. The dark ages are over (thank f**k) & it’s time to reclaim the birth right that everyone can access! Let’s remember our connection to the mystical realms, let’s learn how to navigate it from the joy of the child that still lives in all of us & integrate it into the adult life we live. Walking the Worlds is a magical initiate journey delivered weekly online over 5 weeks, that explores many practices such as pagan & intuitive ritual creation, sacred sexuality basics, magick weaving, ancient technology & creative art processes. It will help you to solidify an incredible relationship with your inner wildness, nourish your infinite potential as a sensual & creative being, & ignite an intuitive connection to the mystery, spirit & the depths of your unique inner landscape. To know the true self is to know the deep call of the souls desire for us. How would it feel if you could anchor a better relationship with your inner child & intuitive wisdom, to hear the call of your soul & learn to give it access points to speak through you? Do you feel like you're holding back from calling in the radiant fullness of your sensual & creative nature? Our sensual nature is directly connected to our ability for creative energy to flow, & the more we restrict the flow, the more we can miss the opportunity to be a clear channel (for whatever you'd like to create in your life). By finding the point of connection between sensual embodiment & creativity, it allows us ease & grace with helping our dreams to take shape in the physical world! The path of mystery deepens our connection to the earth & to the cosmos, where potential is ever possible for us. We can get so caught up in the western reality of "go go go", that there sometimes tends to be a harsh severing of our clear connection to how infinite we really are. When we allow ourselves to drop into sacred space, with reverence & a playful seeking curiosity, our ability to speak to source & revel in the wild magick available around us in any given moment, can be a profound coming home experience. I felt the journey brought me back on track to where I wanted to be. It’s easy to get busy with work and life, that you just start to drop things to the wayside. Aleira has got such a beautiful energy & a really supportive nature. She’s really good at making us all feel supported & open to us asking questions. I feel really connected with my spiritual and witchy self, moreso than I have been in quite a long time. I was craving this sort of space in my life, and I feel my needs have been met. What does this journey involve? Walking the worlds is an exploration designed to help empower, inspire, grow and support the inner wildness we all have within us. This exploration is a fun opportunity to learn new ways of relating with yourself & to gain some new knowledge to take forward with you into your life, to use at any time you need. This journey is designed to get you thinking creatively & become more attuned to the subtle realms, to help you better navigate the real world from a grounded but open place & help create new inner pathways of magical connection, pleasure, power, creativity, inspiration & play. If I gave away what you’ll actually learn in the journey, it would take away from the surrender to the mystery, but if you feel called, even if it's faint... follow it! And If you still don’t have all your questions answered right now, trust your gut & get in touch with me. This is something I hold dear to my heart! Walking the Worlds incorporates many different practices and processes from lots of modalities & lineages I’ve studied, to ensure that the content is not just recycled information that you've heard a million times before. 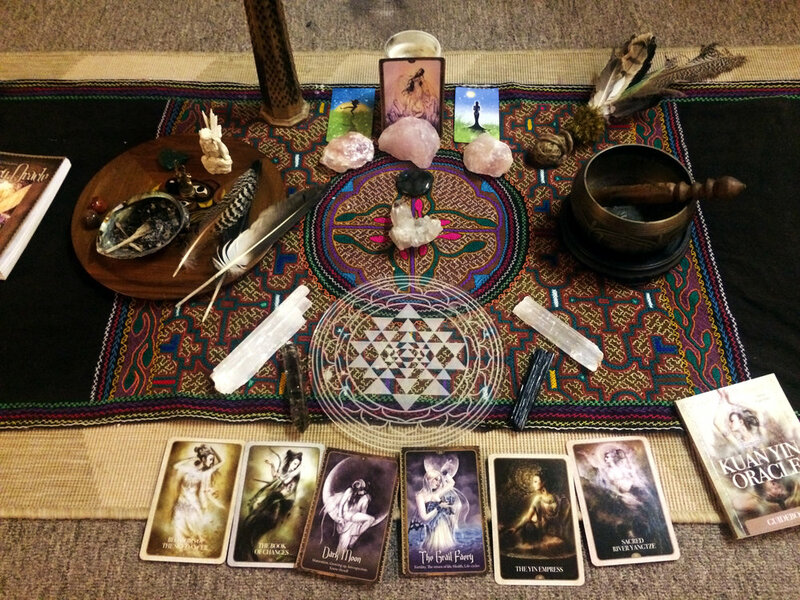 The intention is to journey together where you are gifted with valuable tools & skills that you can then take forward into your life, & use at any point in the future to help stay anchored to your unique magick. This is open to everyone, of all orientations & colours. Walking the Worlds naturally attracts women to the journey, but I want to emphasize that men or those identifying as male, non binary or trans are definitely welcome! Those who have dabbled in meditations/yoga/basics of spirituality will find this a really great way to deepen into your journey of understanding more about yourself, the journey also caters to those who have been exploring some magical things already & might be looking for a refresher or to perhaps try some practices they have never explored before. All the incredible explorations are sent to you weekly via email, the intro live session will be recorded & downloadable for you to look over when you are ready. "How do I know if this journey is for me?" The journey is designed to help people to come more fully into their authentic, wild, magical, spiritual selves. This is to help you become a human who will have anchored a much better understanding of the way you can live a life connected to the earth, to magic & mystery, & know what it is to show up in the real world as a grounded, opened hearted, creative & attuned being.